14 K , 10 diamonds. Checked by Jeweler. Needs a winder. Was only worn a few times. I am not confident enough to open the watch myself for any more information. The number on the face is 23. The 10AN will be incorrect for this watch. Can you please check again and update the listing. Having all the correct details will help the panel make a correct model identification. The latest ads on site for similar Ladies pieces are Dated 1968 and 1969. 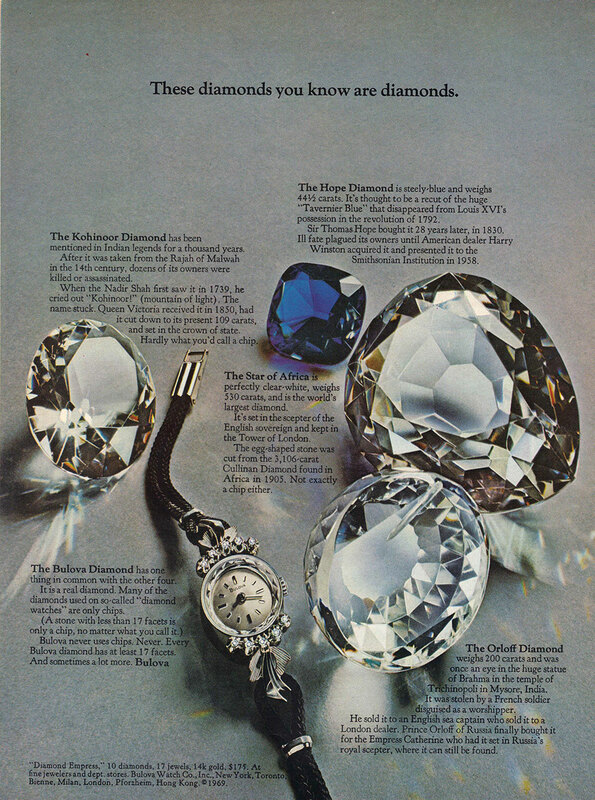 The 1969 ad shows a 'DIAMOND EMPRESS' http://www.mybulova.com/sites/default/files/vintage_ads/Bulova_AD_1969_1... which looks close. "14K Case" and "10 Diamonds" in the descriptive text of the ad being a strong clue to the ID as the Owner states the subject Watch has 10 Diamonds set in the 14k bezel possibly making the Watch a part of the same Model line? Case lugs are a slight variant, but Diamond Empress works for me. Good find Mark. Thank you so much for the information provided so far. I am not sure of the 10 NA , it was more of a guess. As I stated before I am not willing to open the back of this watch myself. I will attempt to get it to a jeweler again. I know it was gift to my Mother from my Father. She was not a showy person so never wore it unless it was a very special occasion. Unfortunately my Mother was a watch winding maniac. It was always what usually sent her usual Timex to their graves. The Watch itself is much too small to contain a 10 linge Movement - more likely a 5 - 7 linge. The dial marked 23 is an indication the dial originally sold w/ a 23 jewel movement. Maybe I heard the Jewler wrong. It has been a few years ago so it could also be my memory. Thank you for your information! it also could be it doesn't have house the movement that originally came with the dial too. Movements were sometimes swapped if/when the price of service was equal to or more than another movement sitting on the jewelers bench. Thoughts on the model PMs?